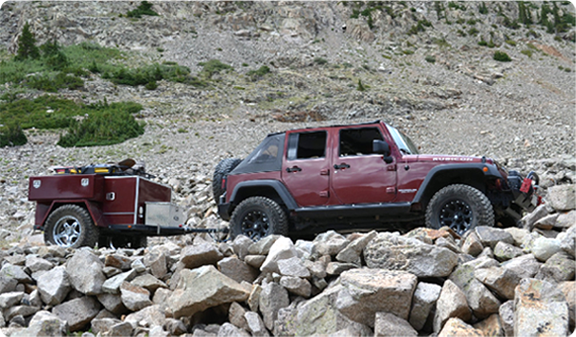 We specialize in custom built off-road camp trailers that are lite weight and virtually indestructible. We can also take care of your custom fabrication needs. Our mission is to furnish a first class product that is reliable and virtually indestructible as well as affordable. Every thing we produce can be built to the customers specific needs. We will use only the best available products. Independent axles with dual rate sealed air spring suspension for a smooth ride both loaded and empty. Kitchen drawer on 400lb. 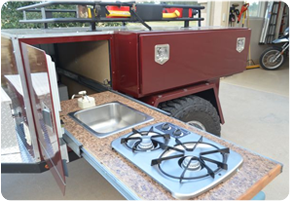 slides with fully functional sink and 2 burner stove. Tires of your size and choosing on wheels that match your toe vehicle bolt pattern. Paint color of your choice. Electric water pump and 6 gal. water tank. 12 volt deep cycle battery. L.E.D. tail and clearance lights. Diamond plate aluminum flooring and tung box. Offroad trailer hitch designed specifically for extreme offroad towing that also works very well at highway speeds. 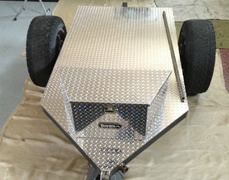 Aluminum diamond plate is used wherever possible without compromising the strength or durability of the trailer. The frame is built from boxed steel only. The pulling tongue is a single piece of 2.5" box tubing which passes completely thru the trailer. The sub frame is built with bouncing off rocks and other obstacles in mind. 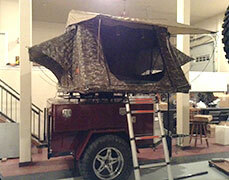 We offer top of the line of roof top tents. These are lightweight, durable and come in several different configurations and sizes. Tents are optional. ©Copyright 2019 Crawlorado Offroad. All Rights Reserved.